The "Power for Paws" Website is taking petitions to protect pets in Kansas City where it is apparently only a misdemeanors to torture and kill dogs. We know from the experts that many abusers start off abusing there's and their neighbors pets as kids. 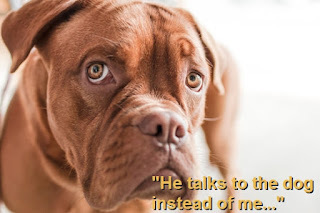 A very strong indicator of whether a man is going to abuse his wife is to see how he treats pets. Is he cold, indifferent to their comfort, and does he punish them harshly? If he is treating a pet that way, you'll be the next in line. Remember the old joke about the newly married couple on their honey moon? The couple were horse back riding and the horse stumbled and the groom got very upset and said, "that's one!" They rode on a bit and the horse took him under a low branch that practically knocked him off his back. The man whipped the horse and said between clenched teeth, "Ok that's TWO!" The new wife was getting concerned and when the horse reared back and the husband slid back in the saddle, leapt from the horse, and screamed, "That's three!" took out a pistol and shot the horse. The wife was horrified and told her husband in no uncertain terms that his reaction was unacceptable. He turned to her red-faced and said between clenched teeth, "OK, that one." Joking aside, if they mistreat animals--get out now! Maybe we could say: "The EQ of a relationship could be judged by the way its animals are treated." Or you know how they tell men to look at a woman's mother if they want to know what their wife will look like in a few years. How about telling women, "Look at how he treats his animals if you want to know how he'll treat you in the long run." Dr. Phil revisits some of his most amazing stories of the season. First, Tim and Anne Marie were desperate to save their mother, Sylvia, who was constantly talking to the voices in her head. After 10 weeks of treatment, see the inspirational turn Sylvia has taken. What will she say when she meets Dr. Phil face to face? Then, just over a month ago, two women told Dr. Phil how they fell victim to alleged con man and bigamist Ed Hicks. See how their story helped another woman and brought Hicks into police custody. Plus, 18-year-old Natalee Holloway disappeared last May during a senior class trip to the island of Aruba. Dr. Phil is joined by Natalee's mother, Beth, her lawyer, and a consultant to the Aruban government who defends the work of the investigators. Have there been new revelations since the last time Beth appeared on the show? Could rescuers be on the brink of finding the missing teen? he walked in and had a rageful fit that I was doing this tutorial....he almost broke the computer, and really scared me. Taking all of the actions on this page may not prevent an abuser from discovering your email and Internet activity. The safest way to find information on the Internet is to go to a safer computer. Some suggestions would be your local library, a friend's house or your workplace. Other safety suggestions: Change your password often, do not pick obvious words or numbers for your password, and make sure to include a combination of letters and numbers for your password. Does anyone else have some things to add for our reader?